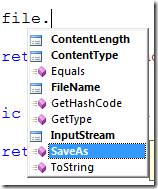 In this HowTo I´m going to give you a short invitation how to implement a fileupload with ASP.NET MVC. HttpPostedFileBase is an abstract basic-class and has the same characteristics like HttpPostedFile. That´s because you are able to make this with a UnitTest as well and create your own deductions from the abstract basic-class. In the "index" view I create a formulary with the HTML Helper. Important: The fileupload only works when enctype="multipart/form-data" is activated! Scott Hanselman has written a fantastic Blogpost about this subject. It also includes how Unit-Tests could look like in such a case.